Four high school kids discover an old video game console and are drawn into the game’s jungle setting, literally becoming the adult avatars they chose. What they discover is that you don’t just play Jumanji—you must survive it. To beat the game and return to the real world, they’ll have to go on the most dangerous adventure of their lives, discover what Alan Parrish left 20 years ago, and change the way they think about themselves—or they’ll be stuck in the game forever. I can’t believe it’s already been 22 years since Jumanji (1995) first released. I never thought there would be another Jumanji film, then again I was wrong. Jumanji: Welcome to the Jungle is a standalone sequel to the previous Jumanji. If you’re asking kids that were born or grew up in the 90s, I am pretty sure they have watched Jumanji. That film is pretty much very popular and the story was rather unusual. Jumanji was supposed to be a board game. Back in the 90s, we played board games more often than we played video games. I am not saying these days we didn’t play board games anymore, but from what I’ve seen around me, kids these days tend to like playing iPad more than board games. So, how Jumanji would keep up with the ‘now’ generation? Although this film is a standalone sequel, the film did begin from where the last Jumanji film left off. If you haven’t watched the first Jumanji film, the film was ended with Jumanji stranded on a beach and founded by someone. Afterwards, somehow the Jumanji board game turned into Jumanji video game. I don’t like the idea of how Jumanji turned into a video game because the process was kind of weird and didn’t make any sense. However, what came afterwards was better because the game was actually pretty thrilling, not to mention funny as well. Like all video games, each character in the game has their own special skills. Jumanji: Welcome to the Jungle also gave each character their own strength and weakness, which turned out for some of them, a very funny skill. 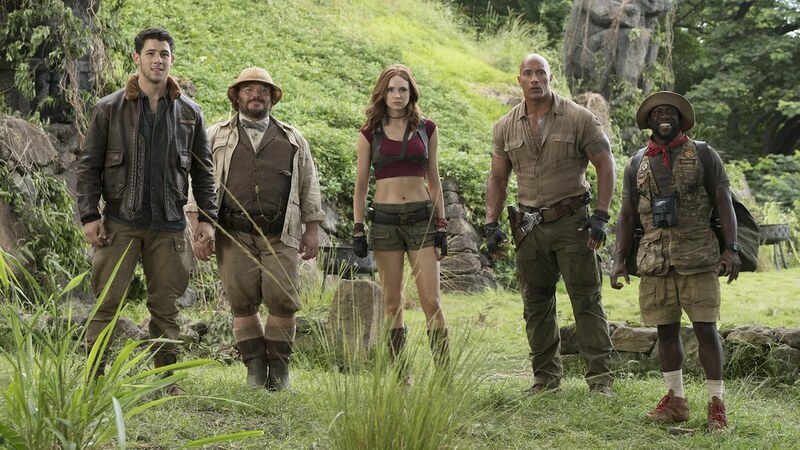 Dwayne Johnson played the character of Dr Smolder Bravestone, a muscle-bound adventurer; Kevin Hart played the role of Franklin ‘Moose’ Finbar, a zoologist who whines a lot; Karen Gillan played the role of Ruby Roundhouse, a martial arts dynamo; and Jack Black played the character of Dr Shelly Oberon, a paleontologist and a cartographer. I’ve seen the combination of Dwayne Johnson and Kevin Hart before in Central Intelligence (2016). They made a good hilarious couple because their performance together would make the audience laughing out loud. The same thing happened here, in Jumanji: Welcome to the Jungle. Most of the time, we would laugh because of what Dwayne Johnson’s and Kevin Hart’s characters did together. Their love-hate friendship was the main reason why the film was very funny. They were really entertaining together and even individually. Dwayne Johnson is no stranger to doing action scenes. Although it’s not as intense as the action scenes he usually did, he did have his ‘video games’ moments in the film. As for Kevin Hart, he never failed us with his sarcastic jokes and comments. Dr. Smolder Bravestone: I’m not gonna get in there, you get in there! Moose Finbar: I got a backpack on! You don’t get in water with a backpack, everybody knows that. Jack Black wasn’t uncommon in terms of displaying comedic performance and this time is no exception. He did it with flying colours. His ‘real world’ character was supposed to be a teenage girl and therefore, Jack Black must talk and walk like what a teenage girl would do—or at least, like his teenage girl character would do. Jack Black managed to do it tremendously well. The way he talked sounded like a girl and the way he moved or walked looked like a girl as well. He really has done his research. He is shockingly good at playing a teenage girl without sounding or looking creepy. What surprised me was the performance of Karen Gillan. Not because I was expecting her to be bad, but because I’ve just realised who she was. I barely recognised her in the film but then I realised it quite later on, that she played Nebula in Guardians of the Galaxy (2014) and Guardians of the Galaxy Vol. 2 (2017). When I watched Jumanji: Welcome to the Jungle, I was very amazed how Karen Gillan did her action sequences. Sure, she has stunt doubles but that doesn’t mean she didn’t do any fighting sequences by her own. She must have done those fighting scenes by herself as well. And speaking of fighting, actors and actresses always have to maintain their body shape fit. They have to work out very hard to get the muscles and such. In this film, it’s not only Dwayne Johnson who has to keep his body shape fit, but Karen Gillan must maintain her body shape as well, seeing how her clothes exposed her abs and thigh muscles. As soon as I realised who she actually was, I wasn’t surprised why she did really well in doing fighting scenes. I mean, for those who have watched Guardians of the Galaxy films, I am sure you all know how many action sequences the character of Nebula has to do. Therefore, doing fighting scenes is no stranger to Karen Gillan as well. She, too, was good at acting funny without really trying to be funny. Her performance in Jumanji: Welcome to the Jungle was really entertaining. This is my first time seeing Nick Jonas on screen. He’s best known as a singer, so his performance here surprised pretty much everyone. Being a singer is one thing and acting is another matter that has no correlation with singing. Acting requires a different skill. Nick Jonas played the character of Seaplane McDonough, a pilot and adventurer in Jumanji. Nick Jonas did portray his character well and pretty much very entertaining. Some even said he’s a scene stealer, though I don’t quite agree with them because well, the main four characters attracted me more. Like all games, there would be a villain required. This time, we have a greedy explorer named Van Pelt, played by Bobby Cannavale. In the 1995’s Jumanji, we also have the character of Van Pelt played with a different actor. Although his name was Van Pelt, it’s a different Van Pelt than the one in Jumanji: Welcome to the Jungle. Bobby Cannavale did portray his character really well. He really got the look of being a villain. I am so pleased with how Jumanji: Welcome to the Jungle took a moment to give some nod and attribution to the first film’s star, the late Robin Williams. It felt really good in a way, especially when you are a fan of Robin Williams and the first Jumanji film. I don’t want to sound harsh, but like all video games turned into a film, Jumanji: Welcome to the Jungle didn’t really have a very wow factor. However, when the usual video game films were pretty much lame, Jumanji: Welcome to the Jungle wasn’t that bad. It’s rather good with all those special effects, action sequences, and funny jokes. The story wasn’t special, but the other factors made the film very fun to watch. The performances of the actors and actresses pretty much were the highlight of the film. Jumanji: Welcome to the Jungle may not be one of the best film of the year—let alone the best film of all time, but surely, Jumanji: Welcome to the Jungle is one of the most fun and funniest of the year. I really have fun watching the film. 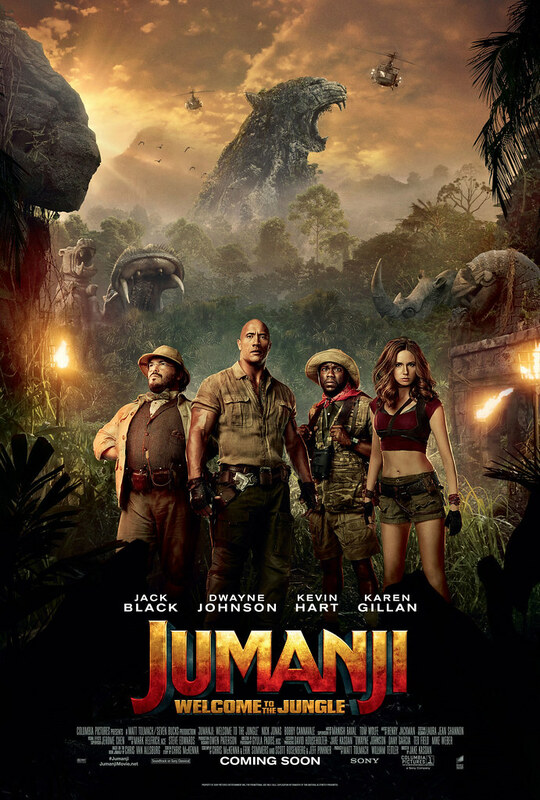 Jumanji: Welcome to the Jungle is a very entertaining and enjoyable film. I laugh so many times when I watched the film. It’s not the greatest film ever, but it is very enjoyable. This film is a must-watch film if you needed some laughs in the middle of your saturating and boring days. I give Jumanji: Welcome to the Jungle 8 out of 10 stars.